In this section, you can download copies of our annual documents. 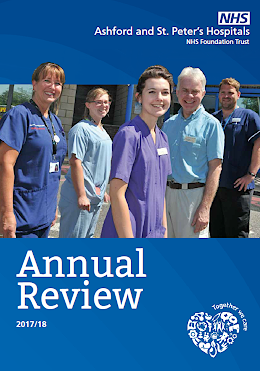 Welcome to our short review of the past year, giving you an overview of what’s been happening in your local hospitals. Overall, 2017/18 has been a positive year for Ashford and St Peter’s Hospitals, despite a continually challenging environment. As always, we have strived to deliver the highest standard of care for our patients, enabled by the hard work and commitment of colleagues across our hospitals . Our year-end position was particularly successful where we recorded an outstanding surplus of £18.9 million. 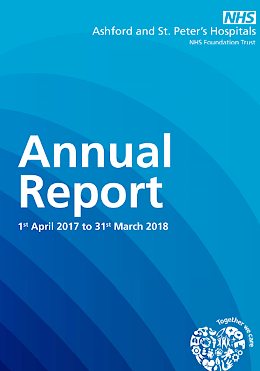 Welcome to our Annual Report which covers the financial period from 1 April 2017 to 31 March 2018. This has been my first year as Chair of Ashford and St Peter’s Hospitals. I joined on 4th September 2017 and it has been a hugely enjoyable and rewarding first nine months. Consistent with the Trust’s open culture, I have been made extremely welcome and have enjoyed getting out and about meeting teams across many services and departments, as well as our local partners. I’ve been extremely impressed by all that I’ve seen and particularly by the commitment of colleagues across the Trust. 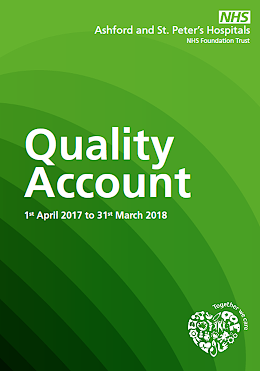 The Quality Account (Quality Report) is an annual report to the public about the quality of services that providers of healthcare deliver and their plans for improvement. The requirement to produce a Quality Account is outlined in the NHS Act 2009 and the terms set out in the collective Quality Accounts Regulations. The Quality Report incorporates all the requirements of the Quality Account Regulations as well as a number of additional reporting requirements set by NHS Improvement (formerly Monitor). The Quality Report specifically aims to improve public accountability for the quality of care and is contained within the Trust’s overall Annual Report. You can also monitor our monthly performance as part of the Balanced Scorecards presented to the Trust Board meetings.